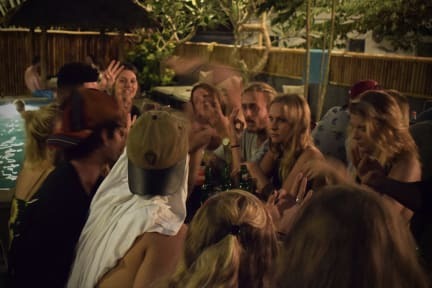 Setting the standards since September 2015 by a four-person Indonesian, American, South African and Dutch team of surfers and travelers, Lay Day Surf Hostel delivers the perfect combination of surf, party and relaxation in the heart of Canggu, Bali's real surfer town and place to be. It's all about getting your stoke up whether it's in or out of the water. To create that feel there are a few things on offer: A fully operating bar open all day - YES, all day! a self-service kitchen, free WiFi, 24-hour security, airport and activity transfers, motorcycle rental, party excursions, not just one but four pools, and of course all the best tips and insights by our incredible friendly staff to help perfect your stay on the island. Our motto: there is nothing we can't help our guests with! The whole property is a superb chilling area with multiple lounge benches all around the yard and 4 pools so you can relax in the sun, get your tan on and recover with yet another cold bintang.... or cocktail? Amazing! Much fun and nice people! So nice I stayed there twice! Best party hotel in canggu hands down. The staff is the best part. Thom drove me 45 mins two ways on his day off to get my bank sorted. I'll be back for sure. Can’t recommend this hostel more, probably my favourite I’ve stayed at in over 6 months of travelling! Ended up staying for more than half my time in Bali here, and I’ll definitely be back! Was recommended by EVERYONE around Bali to stay here and it did not disappoint. I had the 4 bed en-suite which is in a villa area around the corner from the main bar which was a bit pricier: clean, quiet, pool outside the room (there are 4 pools) there isn’t a lock for the room door and you need your own lock for lockers which isn’t the safest but great staff, bar and food, happy hour, and such a good place to meet people. Next time I’m in Bali I will be back 100 percent! Everyone stay here!!! The WiFi wasn’t working at all!! And when we first got there we wanted to rent a towel but they didn’t have any. We needed to wait for 2 days to get one and every time when we went to reception they said come a bit later and we will give you a towel. The atmosphere was nice and they had a bar and a pool. You can’t lock the doors to your room and peopel told us things got stolen from them. Basically a dirty party hostel. Beds are sketchy. The staff was nice. Ended up moving to another hostel in canggu because this was just a little bit too trashy, especially for the price being paid.